Anny Ondra (15 May 1903 – 28 February 1987) was a Czech film actress. She was married to German boxing champion Max Schmeling. She was born Anna Sophie Ondráková in Tarnów, Galicia, Austria–Hungary, now Poland, and died in Hollenstedt near Harburg, Germany. The daughter of a Czech, Austro-Hungarian officer, Ondra spent her childhood in Tarnów, Pula and Prague. Her father's name was Bohumír and mother's name Anna. She had two brothers, Tomáš and Jindřich. At seventeen she played in the theater and acted in her first film. The film was directed by her boyfriend, director Karel Lamač. When her family learned of it, they had a shouting match in which the teenager received a beating from her father - to be an actress, soon after the First World War, was socially almost at the level of a being a beggar. Anna had been educated at a convent school and her father had found for her an official government position. Anna preferred a film career and began to live with Karel Lamač. "I swim like a fish, ride like a cowboy, and I would do it all if the film required it," summarized the nineteen-year-old. After some years she wanted to begin a family, but Lamač did not want to marry. 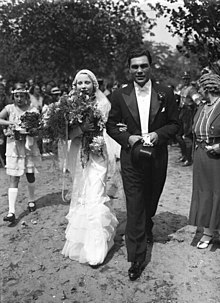 So, after a three-year romance, on 6 July 1933 Ondra married German boxer Max Schmeling, with whom she appeared in the film Knock-out (1935). Their marriage was a happy one, although childless: Ondra miscarried after a car accident in 1936 and could no longer have children. They were married until she died in 1987. Lamač remained her friend throughout his lifetime. He died in her arms in 1952 in Hamburg. Throughout their marriage, German fascists tried to exploit the fame and popularity of Ondra and Schmeling. They were often seen in photos with Goebbels and Hitler - Max as a German superman and Anny as a blonde Aryan (Max was heavyweight champion of the world between 1930 and 1932). However, they never collaborated: Max refused to accept honours and even secretly helped to hide two Jewish children, saving their lives. In Nazi Germany this was a capital offence. After the war, they were penalised financially for collaboration, and an arrest warrant was issued in Czechoslovakia. Nazi propaganda was taken literally and Schmeling never visited Ondra's homeland. After the war, they were left without funds and assets. In 1949 they moved to Hollenstedt near Hamburg, and in the 1950s Schmeling began working for The Coca-Cola Company. Ondra was buried in the Saint Andreas Friedhof cemetery in Hollenstedt, Germany. Her husband Max Schmeling died in 2005 and was buried next to her. The heritage of Anny and Max has been referred to as the Max-Schmeling-Stiftung foundation. She acted in Czech, Austrian, and German comedies in the 1920s; and in some British dramas, most notably Alfred Hitchcock's The Manxman and Blackmail (both 1929). Ondra formed a production company, Ondra-Lamac-Films, with her boyfriend, director Karel Lamač. Lamac directed her in several silent films, acted with her in films directed by other filmmakers, and continued to work together after her marriage with Max. However, when Blackmail was remade with sound, Ondra's thick accent was considered unacceptable, so her dialogue was recorded by actress Joan Barry. Ondra made some 40 more films in the sound era, the last in 1957, and in total over 90 films. Ondra's career in the UK was hurt by the introduction of talking pictures. A test film has survived of Hitchcock "interviewing" Ondra, in which the director teases the actress and asks her some personal questions, making her embarrassed. She returned to Germany and married boxer Max Schmeling in 1933. Ondra was portrayed by Britt Ekland in the television movie Ring of Passion (1978), wherein the character was named "Amy Ondra Schmeling". She was also portrayed by Peta Wilson in the historical boxing docudrama Joe and Max (2002). She was given the Honorary German Film Award in 1970. ^ "Boxing legend Max Schmeling dies at 99". USA Today. Berlin: The Associated Press. February 4, 2005. ^ Canning, Mike (December 2008). "At The Movies: Holiday Season Brings a New Spate of Dramas". Hill Rag. Archived from the original on 2009-03-25. ^ "Funny Ladies 1". La Cineteca del Friuli. 2002. This page is based on the Wikipedia article Anny Ondra; it is used under the Creative Commons Attribution-ShareAlike 3.0 Unported License (CC-BY-SA). You may redistribute it, verbatim or modified, providing that you comply with the terms of the CC-BY-SA.